"FISSION PHOENIX". This extremely rare avian visitor (Grus phoenixii, related to our sandhill crane, but in between the greater and lesser) was first sighted on a winter 2010 survey in the White Mountains north of Fairbanks. She was trying to winterover in a 2004 burn. Though frozen and bedraggled, she accepted capture and withstood three days of sled and truck transport to bring her to my recovery center. She has flourished on a fish diet. Amazingly, she has fledged new plumage this spring. (Preening may lose some feathers, but replacement "spills" are provided.) Though split in places, I think she is ready to return to the wild. 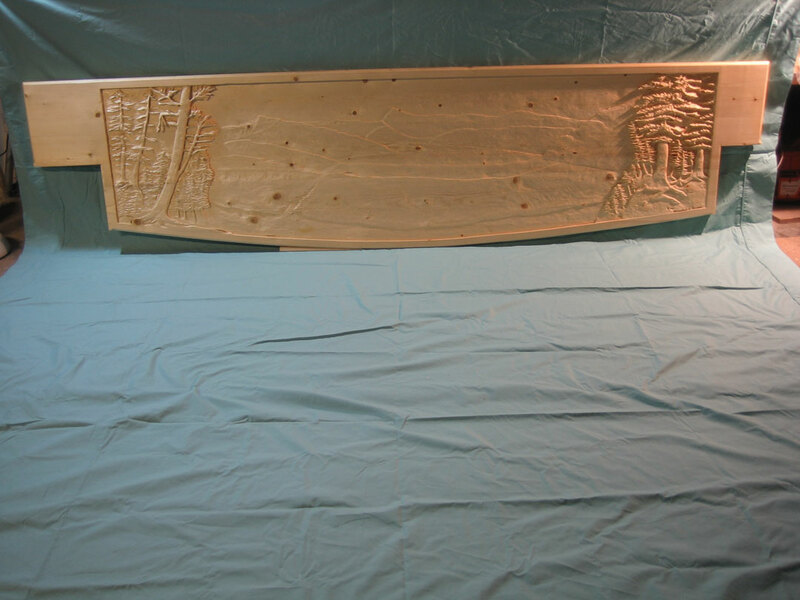 72"H x 36" D x 54"W; black and white spruce, pine and Alaskan birch; May 2010. 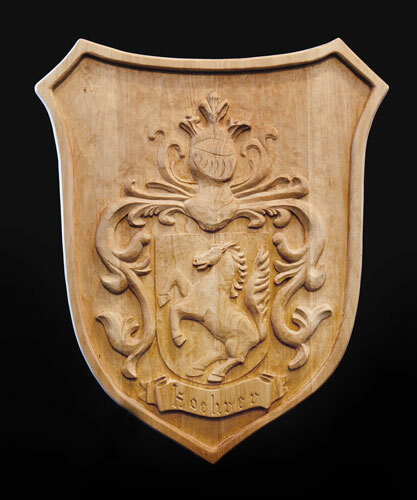 Koehrer Coat of Arms. 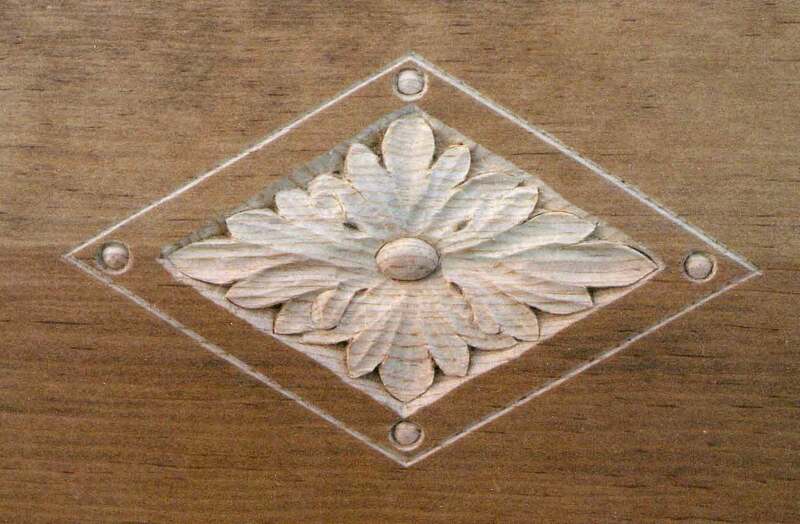 Traditional European-style hand-carved medium relief in basswood. 25"H x 28"L x 20"W; 7/2009. Burl Bear Bowl. Alaskan black spruce; 13" l x 7" w x 9" h; 5/2008. 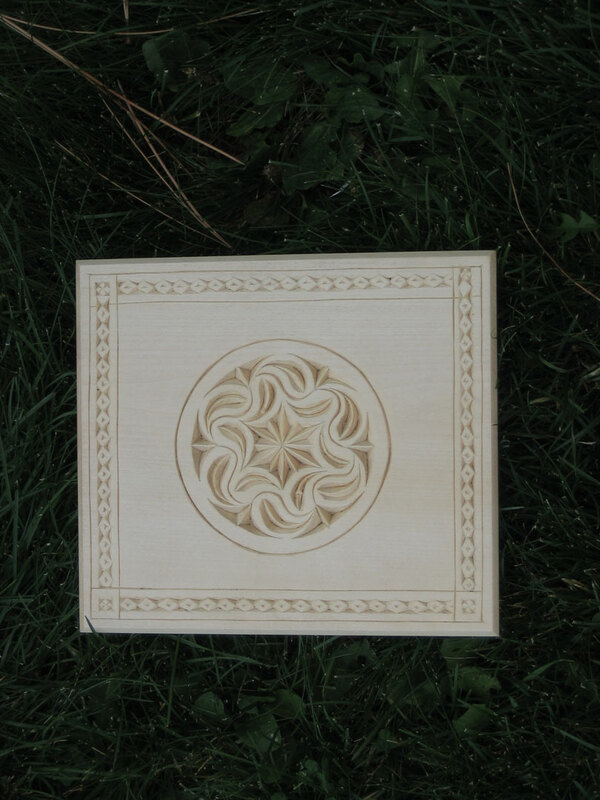 Gothic Swirl Plaque with Border. 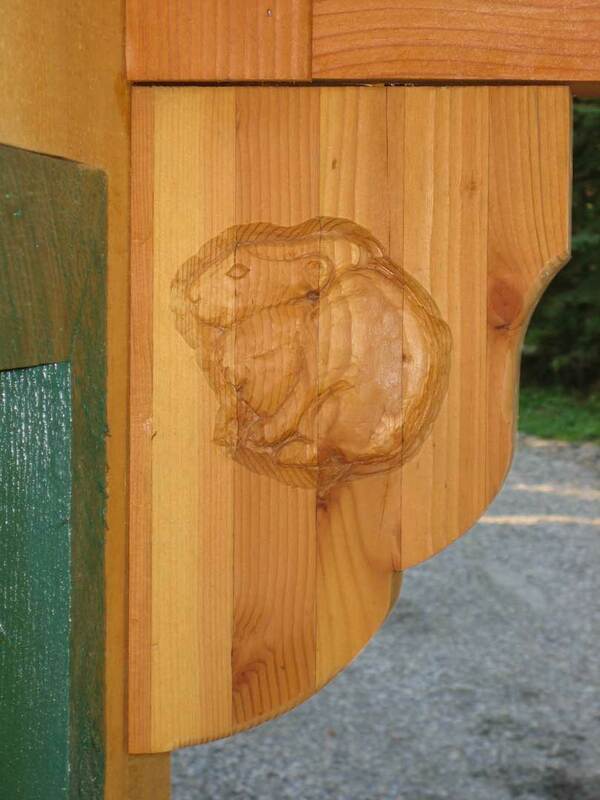 Chip-carved. Alaskan aspen; 11" x 11"; 10/2007. Black Rapids Lodge Medium-relief Carved Countertop. Forest, river, glacier, mountain landscape. Alaskan white spruce; 7' l x 2.5' w x 1" t; 8/2007. 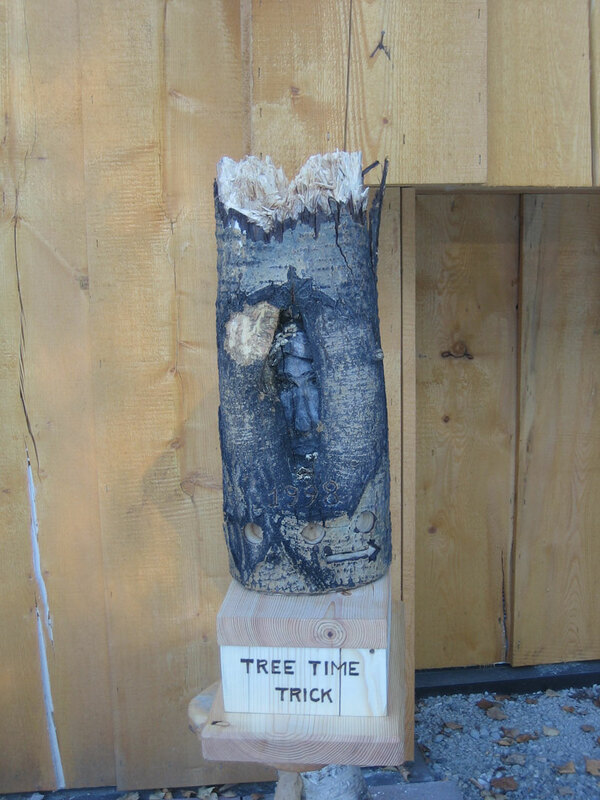 Tree Time Trick, 1998-2006. 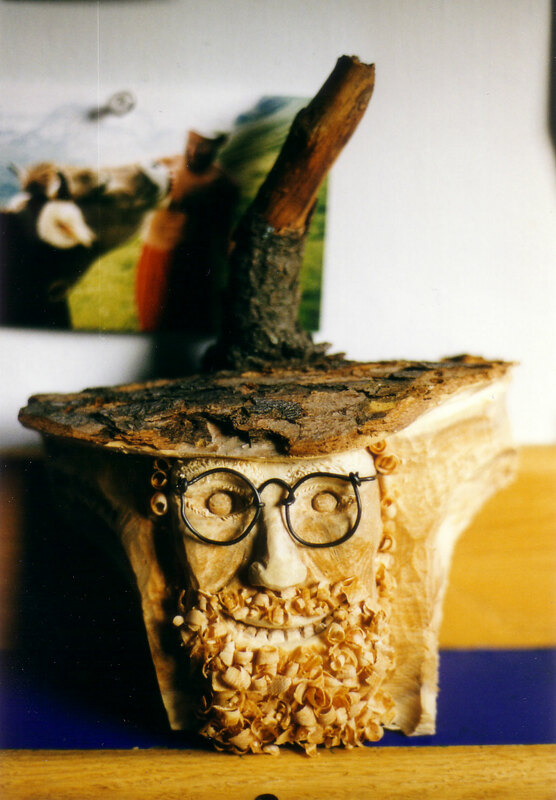 Front view of face carved into living aspen in 1998; grew "parka ruff", lichens and fungi; moose munched and weathered till harvested in 2006. Then original face design recarved on reverse side of tree trunk. Sculpture may be rotated on pedestal. The tricks are that the first sculptured face would normally not "age" in a non-living sculture typically executed in stone. 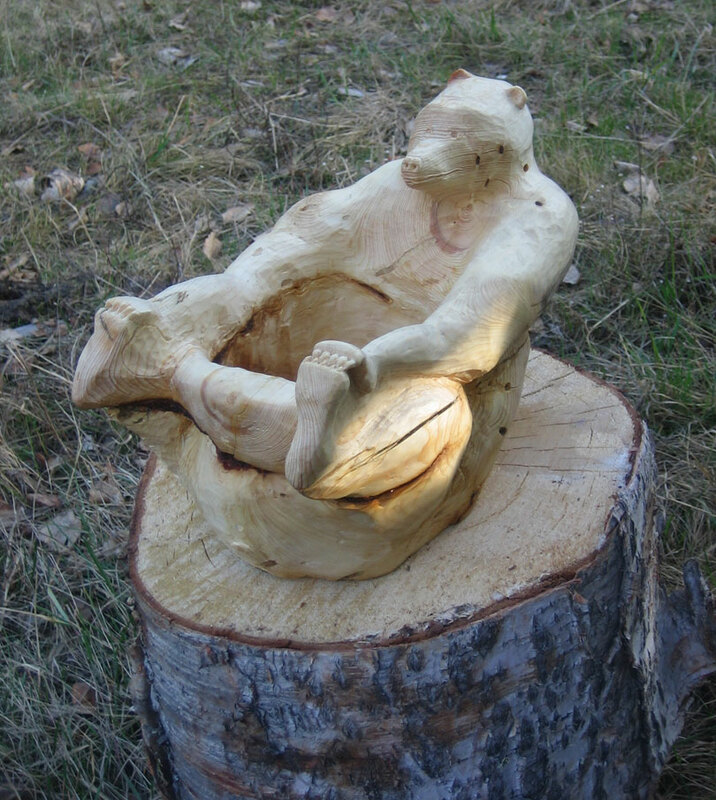 Furthermore, the carving first done in time, 1996, has the older-looking visage, yet a likeness of the same individual aging over time would normally have the more elderly aspect later in 2006 as time passed. Our tree has helped to confuse the audience with the younger face in 2006. 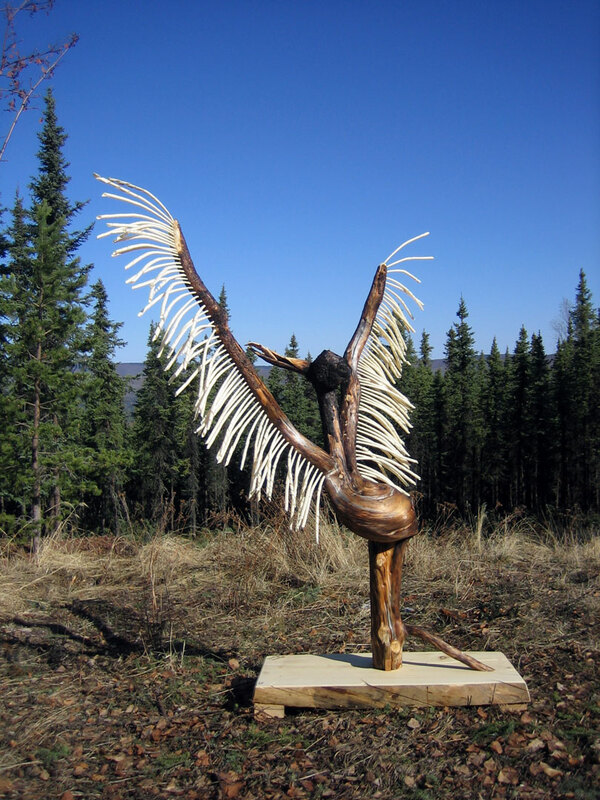 Alaskan aspen, Doug fir, spruce; 26" h x 6" w x 15" l; 10/2007. 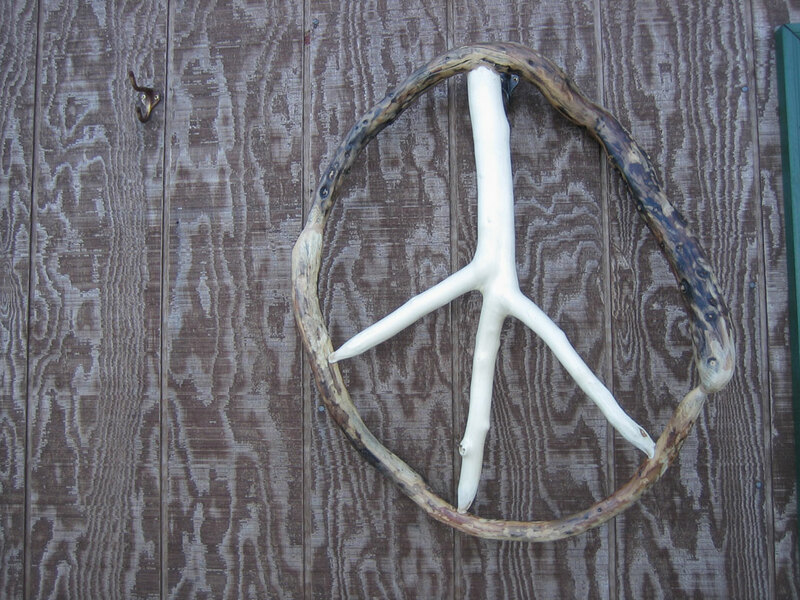 Rustic Peace Symbol. All wood; black spruce and aspen; 20" Dia x 3" t; 10/2007. Corbel with relief-carved Dall lamb and woodpecker. Doug fir laminate; 15" h x 10" w x 3.5" t; 8/2006. 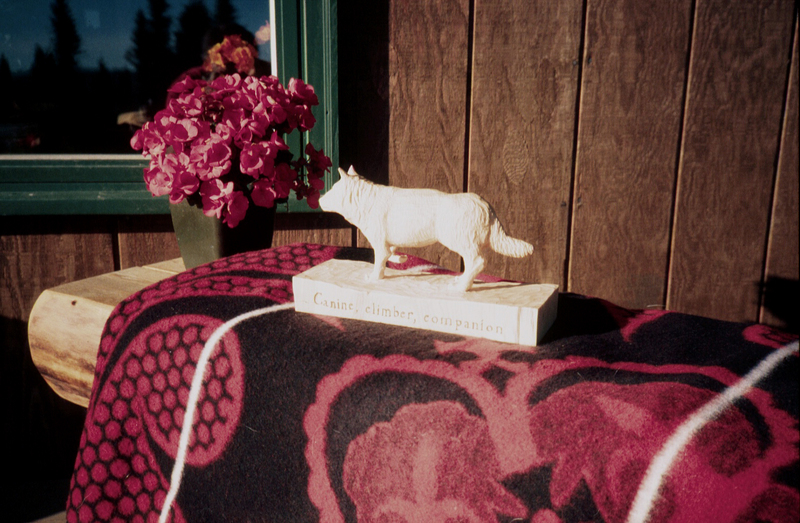 Corbel with relief-carved pika. Doug fir laminate; 15" h x 10" w x 3.5" t; 8/2006. 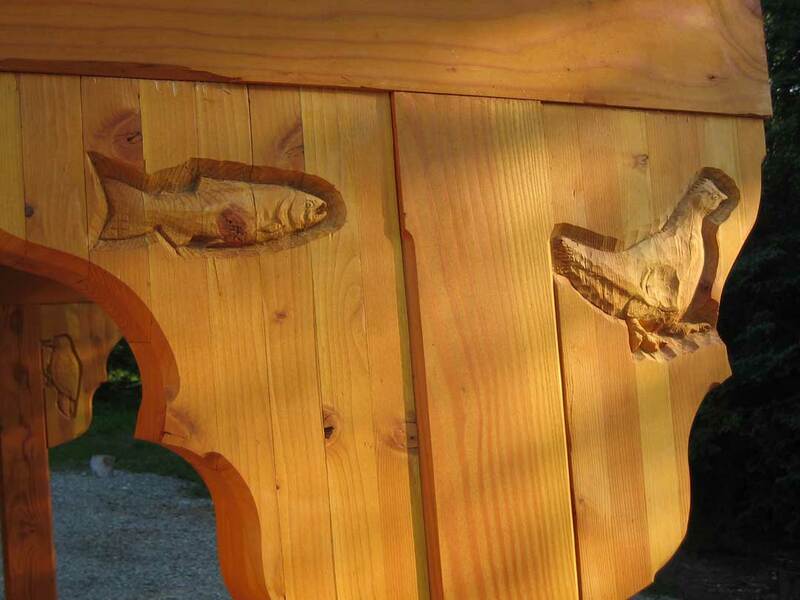 Corbel with relief-carved salmon and spruce hen. Doug fir laminate; 15" h x 10" w x 3.5" t; 8/2006. Acanthus medallion household decoration. Pine, 8" dia, 2001. 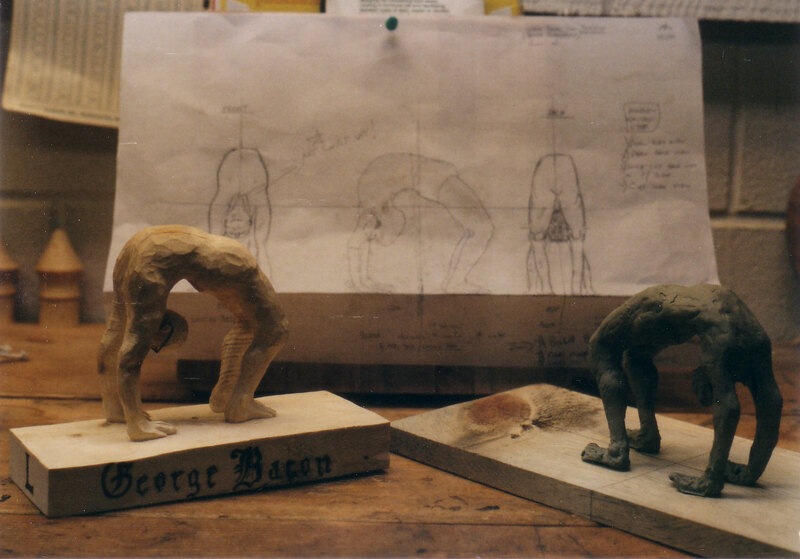 Birthday cake (50th) decoration of man (George Bacon) doing yoga backbend, "Urdhva Dhanurasana." White spruce and baling wire, 9" l x 5" w x 6" h, 1999. This high relief was carved by Marshall and his teacher, Pietro Vinotti. It is of Belle Herbert, a Gwichin Athabaskan Indian of Chalkyitsik, Alaska, who lived to be, in all likelihood, over 120 years old, dying in 1982. Basswood, 34 x 22 x 6 in., 1992. 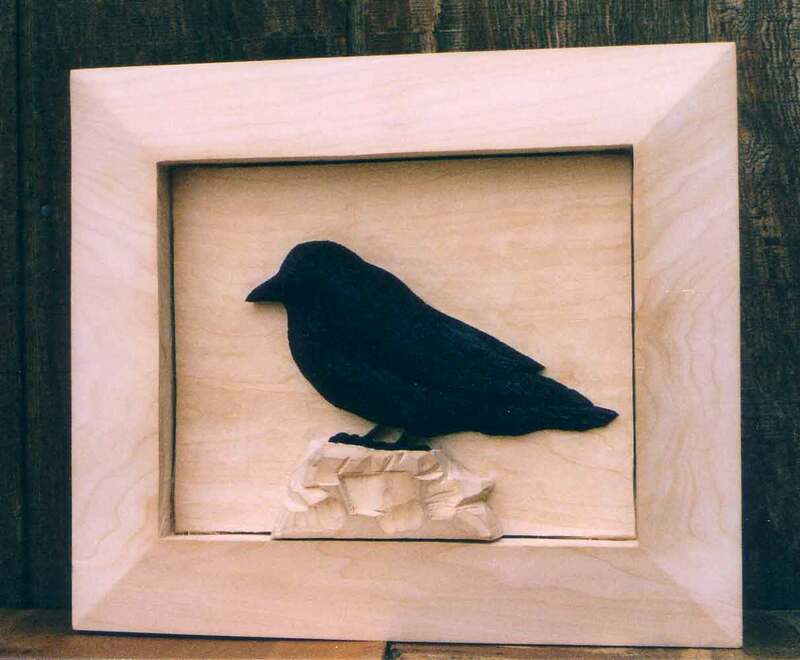 Black-stained raven medium-relief carving. 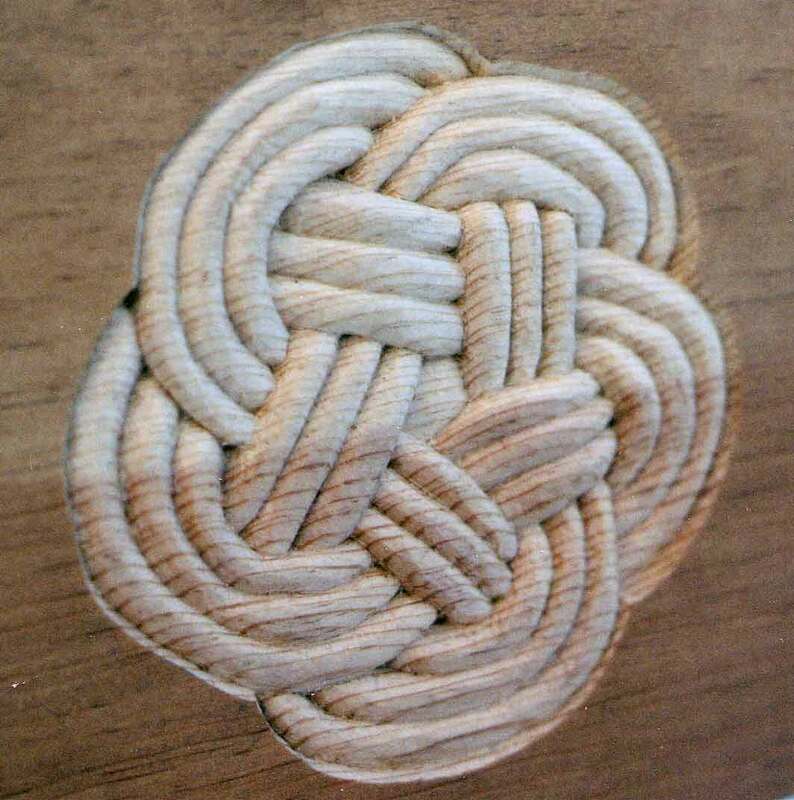 Basswood, 15" l x 12" w x 2 " h, 2004. Gothic "Ultraswirl" for residential entryway decoration. 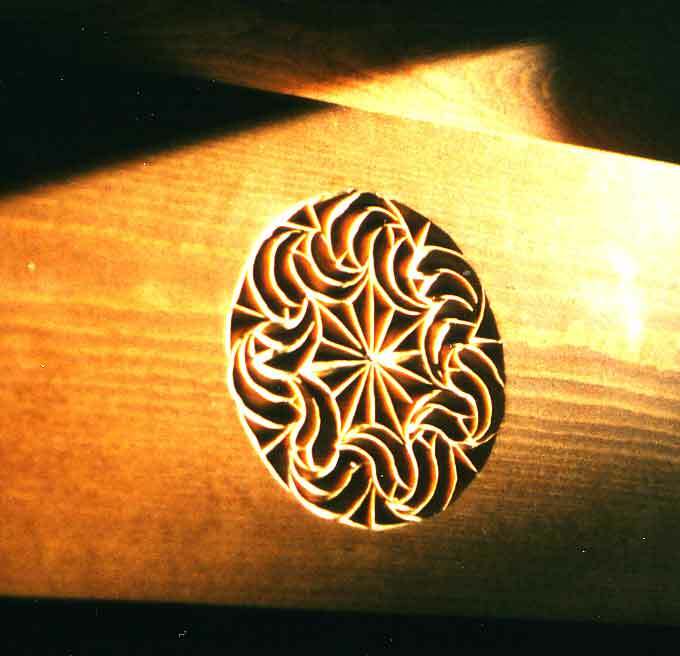 Pine, 7" dia, 2001. Norwegian Fjord horse head. Alaskan larch, 9 x 13 x 5 cm, 1998. Jon Holmgren's birthday head. Black spruce and baling wire, 12" h X 10" w x 6 " d, 1998. Old Audun done with Georg Kielhofer. 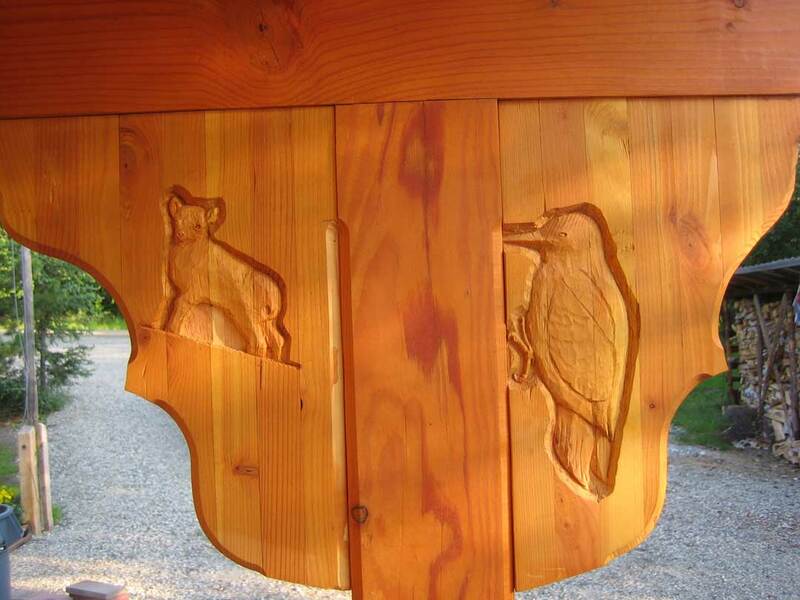 Basswood, 30" h x 14" w x 14' d, 1993. Mariner's knot low-relief architectural decoration. Pine, 8" dia, 2001. An Alaskan husky named Piton who was Marshall's companion. 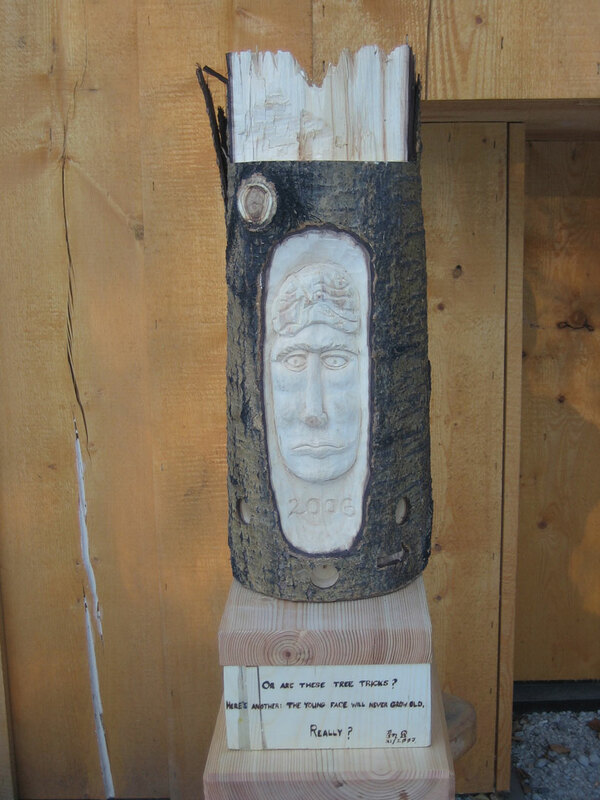 Carved by Marshall and his teacher, Goffried Kaschnig, in Elbigenalp, Austria. Swiss stone pine or zirbe, 11 x 7 x 5 in., 1998. 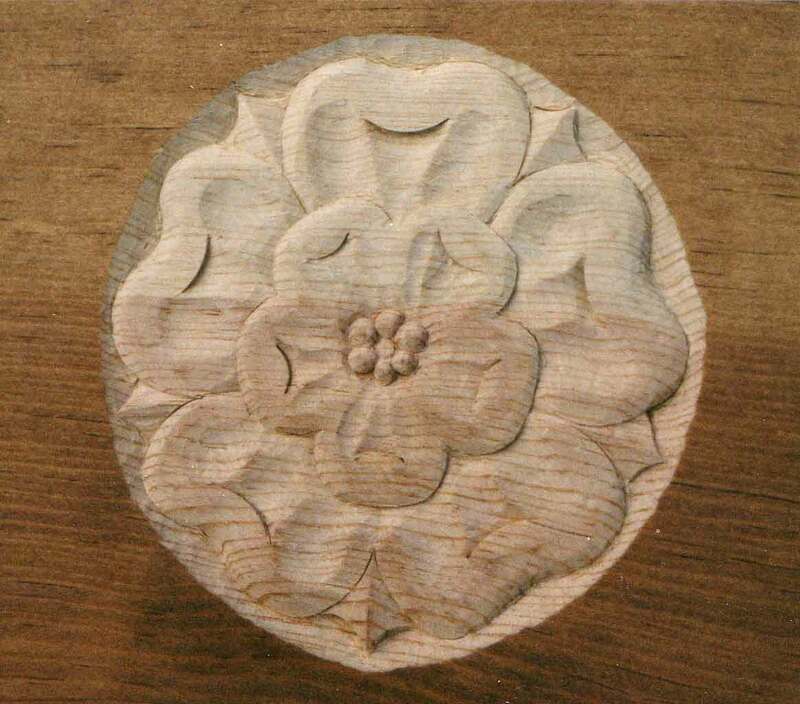 Tudor rose low-relief residential decoration. Pine, 7" dia, 2001.